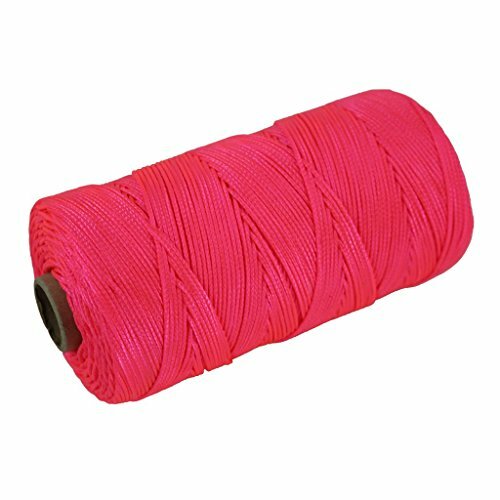 BRAIDED MASON LINE - Nylon mason line is a heavy duty mid-stretch twine that is perfect for a wide range of indoor and outdoor activities, including fishing, boating, masonry, crafting, gardening, marking, and DIY projects. Braided Mason Line has excellent abrasion resistance and does not unravel. SYNTHETIC RESISTANCE - Synthetic nylon fibers provide a durable, long-lasting twine that is naturally resistant to moisture, chemicals, oils, rot, and weather conditions. LIGHTWEIGHT STRENGTH - Nylon fibers are braided to create a mid-stretch line that can hold loads of up to 160 pounds. Braided Nylon Mason Line handles high-stress application with no sag or distortion. LENGTH / WIDTH / COLOR - Choose between pre-cut lengths of 250 feet, 500 feet, or 1000 feet. SGT KNOTS Nylon Mason Line diameter thickness option: #18 (1.52mm | 0.060 inch). Available in: Fluorescent Orange, Fluorescent Pink, Fluorescent Yellow, and White. VETERAN OWNED and OPERATED - Twisted Nylon Mason Line made in the USA. Just like the Marine Corps, SGT KNOTS is committed to being the best of the best. We continue to live by the motto, Semper Fidelisâ€”Always Faithful. Our loyalty to our customers is what makes us who we are, and the reason we continue to grow in popularity and product offerings. We promise to maintain the strength and consistency of our products. We also pass down our bulk savings to our customers.